Please remember to pay $5 for the meeting. 50% of volunteers come from existing volunteer referrals. Employers often have volunteer programs where they want to highlight their businesses philanthropy and will send a whole crew for a day. Use your own suppliers and find if they have this type of program. Schools, colleges and universities have certain requirements need volunteer hours. Check out volunteer interest, go to where they hang out and look for them. 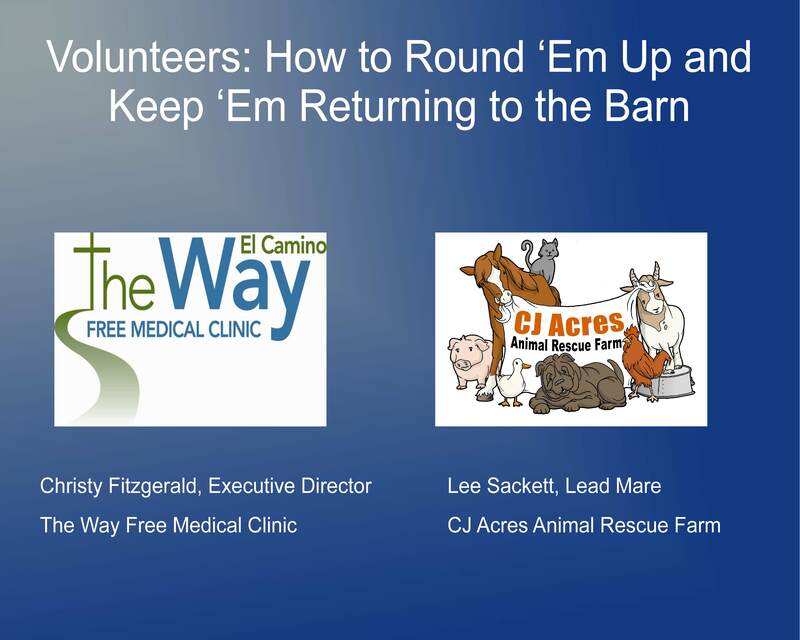 Check your current volunteers’ interest, are they all vegans; and then head to the nearest health food store to post the need for volunteers. Judicial systems may be another area to find people that need community service hours. Broadcast what you do. Use free media. Clay Today and Neighbor to Neighbor allow you to submit items for their community calendars and to submit articles and photos for publication. Use your brochures, websites, emails and business cards to highlight volunteer opportunities. Use the back side of your business card to tell about volunteer positions available. Explore a candidate’s interest. Tie the task they are working on to the greater good in the community, when explaining the need for volunteers, show how other volunteers have made a difference with their accomplishments. Profile your best volunteers, and look for that in other volunteers, find the common demographic geographic, psychographic and search for others with the same traits. Use the test sessions to place volunteers in long term commitment positions. Promote strong passionate volunteers upward. Now that they’re in the barn, what do you do? Have an application to gather info & grow database. You may not have a need for a certain volunteers skill set at this time, but you may have a need for their skills in the future. Have a volunteer packet that contains the following. This allows your volunteers to learn about your organization but also understand the inner workings of your organization. Job descriptions – Make sure job description accurately describes what you would like that person to do. Make sure their values match your mission and the jobs you have available. Training helps them feel comfortable, more likely to return Have ‘staff meetings’ with volunteers at least once a month to know what whole team is doing & share best practices. *learned all of this through the Reinhold training! Conscious of clean, organized, serene, happy work space. Besides doing great things for clients, volunteers are doing something for their own soul. Make sure volunteers respect each other. Need to observe, guide, re-direct volunteers. Sometimes it is necessary to ‘bless and release’ (you may have to fire a disruptive volunteer). Planned – one big planned event/year = appreciation dinner; gifts for everyone from drawing; board helps to generate gifts. “Cause bands” – second time someone returns to CJ Acres, they get a bracelet (each emblazoned with different title: “Stallion,” etc. Jennifer Connell – moving forward we would implement a member spotlight opportunity. One organization would have 5-7 minutes to explain their mission, what they do and how they can use assistance. Please bring flyers or any other marketing materials. Jennifer has a prompt sheet to assist in speaking for 5 – 7 minutes. The spot light speaker will be highlighted on the Shaping Clay website. Hands on Jacksonville –reminds you to sign up on line for their Human Race and Celebrate Good events. Celebrate Good event celebrates volunteers from other groups, 16 – 18 people honored, networking opportunity 4/18 5pm, in seats by 6pm $25. Cocktails The human race – 5k walk run raise money for the walk run, goes back to you. Let us know that you are interested, ½ of registration fee to your organization. Oct 13 at Town Center. 8am Free orientation. Clay County Literacy coalition is in the school house at the Florida village at the fair this week. Mercy is hosting spring outreach with Pinewood Presbyterian 4/14 10-3pm, you are welcome to have a booth. Mercy network office will be opening on Wed phase one – tour on April 19 see the new facility 5-7, Thursday 1540 Business Center Drive, suite c Fleming Island referral center for people with needs. Our next meeting is on April 27.